Jade is a new family of FPGA boards from Pentek and is based on the latest Xilinx Kintex UltraScale FPGA. The Jade architecture embodies a new streamlined approach to FPGA-based boards, simplifying the design to reduce power and cost, while still providing some of the highest performance FPGA resources available today. Designed to work with Pentek’s new Navigator Design Suite of tools, the combination of Jade and Navigator offers users an efficient path to developing and deploying FPGA-based data acquisition and processing. 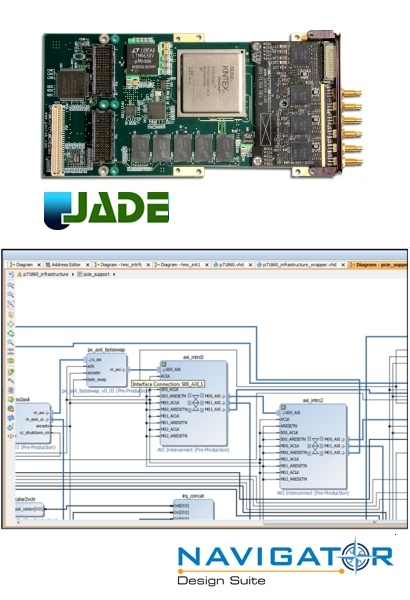 As a central feature of the Jade architecture, the Ultrascale FPGA has access to all data and control paths, enabling factory-installed functions including data multiplexing, channel selection, data packing, gating, triggering and memory control. The Jade architecture organizes the FPGA as a container for data-processing applications where each function exists as an intellectual property (IP) module. Each member of the Jade family is delivered with factory-installed applications matched to the board’s analog interfaces. Typical factory-installed functions may include four A/D acquisition IP modules for simplifying data capture and transfer. Each of the four acquisition IP modules contains a powerful, programmable DDC IP core; an IP module for DDR4 SDRAM memory; a controller for all data clocking and synchronization functions; a test signal generator; and a PCIe interface. These complete the factory-installed functions and enable the board to operate as a complete turnkey solution for many applications, thereby saving the cost and time of custom IP development. The XMC (Model 718XX) card is used as the base module and is listed in the table below. PCIe, cPCI and AMC form factors are supported through the use of an appropriate Pentek carrier card. Pentek’s Navigator Design Suite includes the Navigator FDK (FPGA Design Kit) for integrating custom IP into the Pentek factory-shipped design and the Navigator BSP (Board Support Package) for creating host applications. The Navigator Design Suite was designed from the ground up to work with Pentek’s Jade architecture and provide a better solution to the complex task of IP and software creation. Pentek's Navigator FDK provides the complete IP for a specific Jade data acquisition and processing board and fully integrates with Xilinx's Vivado Design Suite. When the Pentek FDK is opened in Vivado’s IP Integrator, the developer can access every component of the Pentek design, replacing or modifying blocks as needed for the application. The companion product to the Navigator FDK is the Pentek Navigator Board Support Package (BSP), this enables complete operational control of the hardware and all IP functions in the FPGA. Similar to the FDK, the BSP allows software developers to work at a higher level, abstracting many of the details of the hardware through an intuitive API. Developers who want full access to the entire BSP library, enjoy complete C-language source code as well as full documentation. New applications can be developed on their own or by building on one of the included example programs. All Jade boards are shipped with a full suite of built-in functions allowing operation without the need for any custom IP development.